Vedic Astrology Article : CHANDRASEKHAR, FORMER INDIAN PRIME MINISTER, A MEMOIR..my riskiest prediction-1..
Ana Sayfa > Articles > CHANDRASEKHAR, FORMER INDIAN PRIME MINISTER, A MEMOIR..my riskiest prediction-1.. The late Hiralal Chaubey, a noted Hindi journalist, had revised his biography of Chandrasekhar, the former prime minister of India, before his own death. Today, 8 July 2007, Chandrasekhar died in Apollo hospital in the dasha of Venus, a maraka for Mesha lagna. Hiralal had promised to present me a copy of the revised biography because he had mentioned the prediction I had given to Chandrasekhar of his becoming the prime minister at a very crucial time in his career when Chaubey had taken me to him in August 1990. But he died and I could not get the copy of the revised biography of Chandrasekhar. A friend presented a copy of it in 2006 and there is mentioned clearly with my name, the prediction I had given to him in the presence of many people in August 1990 that he would become the prime minister of India for a brief spell that year itself replacing V.P.Singh who was looked upon as a menace because of his notorious Mandal politics. It was the policy of implementation of a poorly investigated, fudged and manipulated report on reservations for the other backward classes of India, the notorious report of B.P. Mandal. How can this happen in the mahadasha of debilitated Mercury was the question of some astrologers sitting in the large gathering at the place of Chandrasekhar who loved to have a gathering of people around him always. I had insisted that it would happen in the mahadasha of Mercury and the antardasha of Moon very suddenly. In Jaimini it would the mahadasha of Kumbha and the antardashas of Simha. In transit, Jupiter would be in Karka then and Saturn in Dhanu. On the insistence of Hiralal Chaubey I had written a very long article, almost six columns explaining the prediction in Hindi in the Hindi newspaper of Calcutta, Sanmarg, for which he worked as Delhi’s special correspondent. Later, after I had retired, I had written in the Vishwa Vijay Panchanga (Hindi) that Saturn in Makara will lead to his fall. In the Times of India, in an interview done by Miss Mandalekar, I had said that the Congress would come back to power. In an interview to Calcutta’s Sunday, a weekly, I had said that during the election of 1991, a prominent leader would be killed. That was Rajiv Gandhi who was killed on 21 May 1991. Those days, unlike now, I used to do lot of mundane astrology and fortunately got so many authentic horoscopes, unlike now. I had a string of brilliant predictions to show then. Then I lost interest in political predictions. 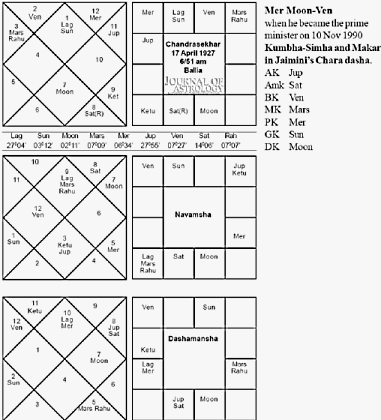 It was easy to double check the prediction I had given to Chandrasekhar with Chara dasha where from Kumbha, his Amatyakaraka, Jupiter would be in the tenth house. I should not have taken that risk as I had still three more months to retire from my service. Yet, I did it because of my respect for both Hiralal Chaubey and Chandrasekhar. It remained unnoticed, unknown and I retired peacefully. Earlier, in 1988, in an interview to the Onlooker (Bombay) now defunct, I had said that in 1989, there would be a change in the central government on the basis of an original research of mine in mundane astrology. My explanation was called for. I escaped by saying that it was an academic research which I was testing. As government servants we are punishable under the conduct rules if we participate in politics and a political prediction could be construed as participation in politics. Chandrasekhar became the prime minister in November of that year (1990) and fell after seven months. During a visit to the Mussorie or Simla Academy, as the prime minister of India, he had defended astrology strongly saying that he had evidence of the correctness of astrological prediction and of astrology being a science. I have to explain why I took the risk of giving the prediction so openly, the first and the last time ever, in an open durbar of Chandrasekhar. In the briefest membership of the Socialist Party of India I had for two years because of the inspiration provided by Acharya Narendra Dev to our generation of students, I had met Chandrasekhar once in Aminabad office of the Socialist Party, Lucknow where he had come to stay from Allahabad or Varanasi. He continued in politics and mine was over after Acharya Narendra Dev left Lucknow University to join Varanasi University as vice chancellor. But from what I saw then of Chandrasekhar, doing his PhD from Varanasi those days, he appeared to have the scintillating intelligence with sharp analytical powers of late Achyut Patwardhan, Purushottam Tricumdas but he could never reach the great eloquence in Hindi of Acharya Narendra Dev which was equaled or even surpassed by Deen Dayal Upadhyaya of the Jan Sangh. You cannot be in politics without being unscrupulous and cannot succeed without becoming totally unscrupulous. Yet, for Chandrasekhar I had some sneaking admiration because he had stood up to Indira Gandhi, challenged her almost, and got elected to the Congress Working Committee inspite of her opposition. Indira Gandhi, the vindictive woman, had her revenge when she got him expelled from the party and got him arrested during the National Emergency of 1975. During his imprisonment, he wrote his jail diary in Hindi which is a great piece of literature besides giving some insights into lesser known aspects of Indian politics. For instance, Indira Gandhi had told Biju Patnaik that elections should be made so expensive that opposition parties should find it difficult to fight it ! That was the story behind the enormous corruption of her era, which has now become our national legacy. I will narrate in the second part how I had fixed his lagna as Mesha on the basis of which I had given him the riskiest prediction of my life so openly and which was so well known to so many. Professor L.P.Singh, his life long friend, former head of the department of philosophy of Gaya University who now goes to foreign universities to lecture on Indian philosophy, on Tantra, Buddhism refers to this prediction of mine often, even now. Hiralal Chaubey, himself an astrologer, had given to him Mithuna lagna with which I had not agreed. After verifying the life events of Chandrasekhar, I had given him Mesha lagna, last navamsha and given to him what to date is my riskiest prediction. Not arguing with me, Hiralal took me to Chandrasekhar and asked me to tell about my prediction. I will explain it in the second part as I have to go out of Delhi and am in a hurry.